Bayern Munich right-back Rafinha has been slammed by a fan as a ‘racist piece of s**t’ in an exchange a Twitter user claims to have had with the player. The Brazilian can be seen in the picture above posing in traditional Arab dress holding a bomb, with the Daily Mirror reporting on the uproar the image caused. 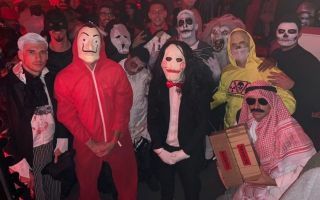 Rafinha’s outfit certainly looks needlessly provocative and not like the kind of traditional Halloween costume you usually see anyway. Quite why the 33-year-old went for that over a simple Vampire, ghost or skeleton is beyond us, and it’s made him look like a bit of an idiot as a result. It remains to be seen if Rafinha will face any action over this, but a top-level footballer and public figure should certainly be reminded of his responsibilities to set an example and not reinforce unhelpful stereotypes in a time of growing division and the rise of xenophobic rhetoric by major political parties around the world.